Subject: Has this mining/exploration mechanic been used? This game is going to simulate a group (or individual) of dwarves digging into the grounds below. They will find resources that they can use to craft new goods, and will continue exploring, spelunking, and crafting, until some end-game requirement is met. There will be 16 stacks of cards laid out like the above picture. Each stack will contain 10 cards each. The number on the bottom right represents which terrain level is currently shown. Think of it from a top-down perspective. 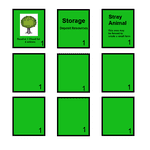 The stacks are arranged in order, so if one grass card is removed, the next card shown will be a terrain level 2 card, showing the rocks and earth beneath the surface. Some surface cards (We’ll call cards with terrain lvl 1 surface cards from now on) have trees and rocks on them. These cards can’t be removed (dug away), but there are ways to access the cards beneath these cards in a different way (explained later). I'm making the map a little smaller. After working out some rules, I think a 4x4 might be too big. All the cards in each layer will be shuffled thoroughly so the map changes every game. Here's what I'm working with at the moment. I'm trying to make this card game resemble games like Dwarf Fortress or Minecraft, and I was wondering if this mechanic, or similar mechanic, has been used before. Please feel free to add any extra comments or suggestions as well. Haven't seen something like it before, but I just want to say that I think it's a really neat idea! A simpler version is used in the second expansion of Ghost Stories: Black Secret in which the ghost player digs for the remains of Wu-Feng (final enemy). During the digging phase magical items can be found to give an advantage of some sort to either the ghost player or the taoists. There are up to 4 levels depending on the number of players. The surface itself is always the same and does not require special items. A brand new one coming out at Essen. I only know about this one because I have been working on an abstract game with digging moles that uses a similar mechanism, and was wondering the same thing that you are. Hmmm. That sounds like a cool game. I'm definitely still going to continue working on my idea. It doesn't look like there are too many games that utilize this mechanic, so I'm sure it would still be creative. I'll just have to make it my own and add unique elements. I'd love to check out your game too! It sounds like a lot of fun. Yeah that's the spirit! Stick with a game and something unique will come out of it. I usually create a forum post about a game once I get it to a functional playtesting state. I will send you a geekmail once it gets far enough along. My game has a digging mechanic, but it does not have layers like yours (really cool idea by the way). You move your moles around (a hex grid) and dig at marked locations which have food items that spread out sort of similar to Mancala/Pandemic. I have had a similar idea to use for either mining, gardening, dungeon crawling or even multi-level fighting that uses the 3x3 card protectors as "layers" that can easily be seen, altered, and inserted between the layers but havent quite found the elegant mechanism or system to fully utilize it. The old billboard game makes some use of the mechanism but I really think it could be made into something deeper and more strategic. Undermining does something very much like this, but "sideways". You can see what you are digging for, but so can every other player, of course. And you can use your finds to either score points, or improve your digging materials. I like the fact that it is not random -- I mean, suppose in your game you hit a tough rock which you cannot easily dig through: why would you take the trouble to get through it if you do not know for sure that it will reward you? That is an interesting mechanic, using a sideways approach. I want the game to be random but only semi-random. I came up with an interesting idea for how to randomize the map. The player in setup will take all the layer 1 surface cards and shuffle them. Then, they'll take all the layer 2 cards and shuffle them, the layer 3 cards, and so forth. They'll then have 5 stacks of 9 cards each. Then, they will arrange new stacks using the top cards of each of these stacks. That way, each stack in the 3x3 would have 5 cards, going from layer level 1 to layer level 5. The player won't know exactly where the "goods" are in the map, because the placement of the stacks are randomized, and the player doesn't know what is in each stack. He does know, however, that the further down he travels, the better the goods he'll find (layer level 5 cards contain much better resources and goods than layer level 2 cards). So yes, there will be luck in the sense that the player won't know where, on each layer, the best items are found. But they will know that they should try and get to the deeper parts of the map as quick as they can, because those areas are proven to contain better things. I haven't played it, but The Lost Dutchman seems to have a similar digging mechanic if I'm not mistaken.